HCM City topped the medal tally of the National Youth Swimming Championship in HCM City on July 16. The team won 24 golds, 14 silvers and eight bronzes to lead. National Defence Sports Centre 5 came second with 17 golds, 12 silvers and eight bronzes, while Long An were third with 10 golds, 10 silvers and 12 bronzes. On the third day of competition, Nguyễn Diệp Phương Trâm of HCM City took gold in the girls 18 and under category’s 50m backstroke with a time of 30.84secs. Lê Thị Loan of National Defence Sports Center 5 and Hoàng Thị Trang of Thanh Hóa were the runners-up. In the boys 11 and under category’s 50m freestyle, Huỳnh Tuấn Anh also brought HCM City a gold after clocking a time of 29.79secs. Anh’s teammate, Hồng Duy Anh and Hồ Hoàng Khánh of Trà Vinh bagged silver and bronze, respectively. Trần Lê Thanh Nhân of Vĩnh Long seized a gold medal in the boys’ 14-15 division’s 50m freestyle with a time of 26.72secs. 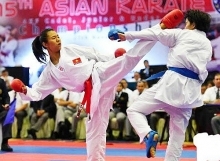 An Giang’s Võ Trí Trung received a silver medal and HCM City’s Trần Hoàng Quân got bronze. The five-day event will conclude today.